Scranton is not the first place that comes to mind when people travel to Pennsylvania. Yet Scranton has historically been a breeding ground for political families, and this year, the city is playing an outsized role in the presidential election. Hillary Clinton, whose father lived in Scranton and was buried there on April 11, 1993 in the Washburn Street Cemetery, has played up her ties to the Electric City by telling supporters “nobody will love Scranton more than I will as president.” Vice President Joe Biden, who joined Clinton in her Scranton rally in August, was born and raised there. But as Election Day approaches, will Scranton voters be swayed by the family roots of these two prominent Democrats? Most say, in fact, that these politicians’ ties to the city meant little to their voting decision. Ky Betts, a freelance illustrator from Scranton, believes the city has come under the spotlight due to Clinton’s family ties there. He is planning to vote for Hillary on the belief that her policies, rather than her family connection, would benefit small businesses in Scranton. “Plus, like so many, I am deeply in college debt so here’s hoping this issue will be addressed during her first term as President,” Betts said. Jason Riedmiller, a Scranton-based freelance photographer, has lived in the city over the past ten years shooting portraits of Scranton residents and photos for music bands and concerts. He also photographed three presidents—President Barack Obama in Scranton High School and Lackawanna College, and Bill Clinton and George W. Bush at political rallies in Scranton—and hopes that Hillary Clinton will be the fourth president he captures on camera. Pennsylvania has voted democratic in the last six presidential elections but is generally considered a swing state, which means the race between the Democratic and Republican candidates is so close that it could go either way. With just a week left to Election Day, Clinton has a 90 percent chance of winning the general election if she wins Pennsylvania. This compares to Trump’s 72 percent chance of victory if he wins the Keystone State, according to the FiveThirtyEight polls-only forecast as of Oct. 28. Lori, who asked that her last name not be used, moved to Scranton for retirement after working in New York City as an architectural engineer. Despite being a Democrat all her life, Lori is canvassing for the Republican presidential candidate outside of Scranton in Clarks Summit, Pa., where the Trump campaign office is located. Lori said she is voting for Trump because “our whole country is falling apart” and that “the vetting of people allowed in our country is very important.” “Trump might not say it the right way but his idealism is correct,” she said. As Scranton has seen an influx of immigrants, at least 1,500 Nepalese resided in Scranton, the Catholic Social Services of the Diocese of Scranton told The Washington Times in 2015. The organization has offered resettlement services to refugees under a contract with the U.S. State Department since 2009. Paul Helring, a police officer and president of the Scranton Lodge of the Fraternal Order of Police, is a registered Democrat. Helring said while the National Fraternal Order of Police has endorsed Donald Trump, he is personally undecided about who to vote for. 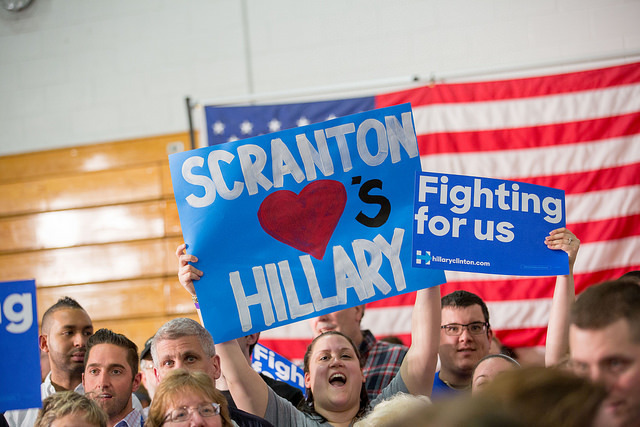 Clinton’s Scranton roots would not affect his decision, he said. Some in Scranton say that the candidate’s policies will play an important role in guiding voters as they choose the next President. Attracted by its lower mercantile tax compared to bigger cities in Pennsylvania, and its supportive small business environment, Lara Alexiou set up her yoga business, Steamtown Hot Yoga, in Scranton. “Instead of saying they’re going to vote Republican or Democrat, people really have to step back and look at what candidates and policies they want to be supporting,” she said.